I’ve always thought of celery as a background ingredient, chopped and sauteed with onion and bell peppers before ending up as a minor player in a soup or stew. Being a big fan of celery, however, I’ve been spotted before with a stalk in one hand and a container of peanut butter or hummus in the other. I thought today’s post should move celery out of the shadows and into the spotlight, so I’ve created a Celery Caesar Salad. Celeriac, also called celery root and a cousin of common celery, provides a double dose of flavor for this salad. Edible raw or cooked, this gnarly root vegetable tastes similar to its common relative. If you’ve never tried celeriac, you should. You can roast it, saute it, blanch it, and mash it, the latter being my favorite preparation. Enhanced with a little butter and cream, mashed celery root becomes a delicately flavored vegetable perfect as a side dish for a roasted chicken or pork roast. I’ve made a traditional Caesar dressing for this salad of sliced celery, julienned celeriac, croutons, and shaved Parmesan cheese. Why not make celery the star of the show with this simple, yet delicious, appetizer course? 1. Mince garlic and anchovy filets. Using the side of a knife, press into a paste. Scrape up paste and place in a small bowl. Whisk in egg yolks, mustard, lemon juice, vinegar, Worcestershire sauce, salt, and pepper into garlic and anchovy paste. 2. Slowly drizzle in olive oil, whisking vigorously. Continue adding canola oil, whisking until completely emulsified. If making dressing ahead, cover with plastic wrap and refrigerate. 1. Preheat oven to 400 degrees. Melt butter in a small pan. Add olive oil and garlic and saute for 1 minute. Pour butter and olive oil over bread, sprinkle with salt, and toss well. 2. Place bread on a baking sheet and transfer to the oven. Bake for 8 to 10 minutes or until croutons are lightly browning. Remove from oven. 1. Combine celery, celeriac and croutons in a large bowl. Add dressing to taste. 2. Divide on salad plates and top with shaved Parmesan cheese. Serve immediately. Happy 2015!!! Hope you had a great holiday! Love this salad! I’ve never had celery root before but that is going to change. 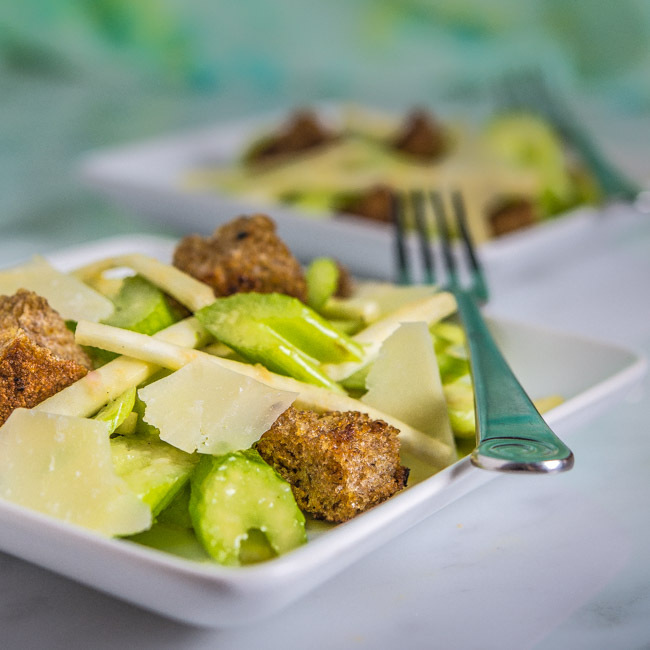 There is a simple little salad that I make from a The Greens Cookbook that uses just celery and shaved Parmesan with a simple dressing. I love what you’ve done here with the Caesar dressing and the simple ingredients of the salad. A nice salad for the new year. Cool! I love this idea a ton Bill, and that you used celeriac too. I agree it needs to move out of the background and into the limelight. Yeah, celery doesn’t get enough love, does it? Nor does celeriac. Too bad, because both can have really wonderful flavor. I’ve made a similar salad with celeriac, but love the idea of adding celery. And taking the dressing in a Caesar direction. Really nice — thanks.